This blog post marks a first for me; it is the first time that an author contacted me and solicited my review of a book. While I was deeply honored by the request, I also felt a twinge of trepidation. What if I hated the book? Would I be able to critique it honestly? I decided to accept the book and to give it an honest appraisal, because if you are a writer, you need to be able to take criticism. Thankfully, I liked the book. 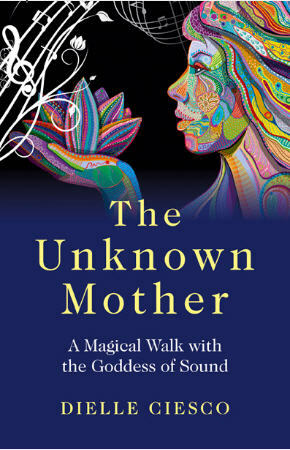 The book is a New Age spiritual tale about a woman’s encounter with a mystical being (Matrina, the Goddess of Sound). Matrina instructs the protagonist on the spiritual use of sound. Stylistically, the book reminded me a lot of Carlos Castaneda’s works, where the magical person instructs the student, who doesn’t always grasp the ideas that quickly. In fact, references in The Unknown Mother to the nagual and impeccability made me feel fairly certain that Ciesco was influenced by Castaneda. The book contains many interesting passages, but a couple really stood out for me. The first one addresses how the function of words has changed: “Words were originally intended to be tools for us to master. But at some point in our evolution, everything got turned upside-down and words became our masters.” (p. 43) This is spot-on. Words are symbols, used to represent things when we communicate. But as I look around, I see words being used to distort and alter reality. We have allowed words to dictate our interpretation of the world around us. Another passage that resonated with me deals with the mystical power of music: “music is the key to a doorway you are only just now discovering. Music is the portal to the next world–one we create with our every thought, belief, and dream, with every word we speak and action we take.” (p. 100) As a musician, I am keenly aware of music’s ability to express the ineffable, as well as its ability to express pure emotion in a language without the need for words. Music can also aide in shifting one’s consciousness, which is why drumming and chanting are often incorporated into rituals. If you are interested in New Age ideas, then you will definitely enjoy this book. For me personally, there wasn’t much here that I felt was new for me, but that was OK. Ideas tend to slip to the back of my mind, and reading a fresh expression of those ideas brings them back to the forefront. I now have things to contemplate… again.